After Mike and I did a thorough job birding Fort Tilden last Saturday morning I was surprised when Daisy agreed to let me out of the house for another morning’s birding at the same spot on Sunday. The company was different, with Seth and I, both Queens birders, being joined by Isaac and Tom, two birders from Staten Island who I had first met when twitching Jamaica Bay’s Black-bellied Whistling Duck. The wind had been northwest overnight and was predicted to switch to west winds, so we wanted to be out early to take advantage of the northwest winds while they lasted. When Seth and I arrived at the small parking area by Fort Tilden’s community garden, Isaac and Tom were just getting out of their car. Our plan was the same as usual when birding the coast in fall; work the edges, especially those edges that were sheltered from the wind. 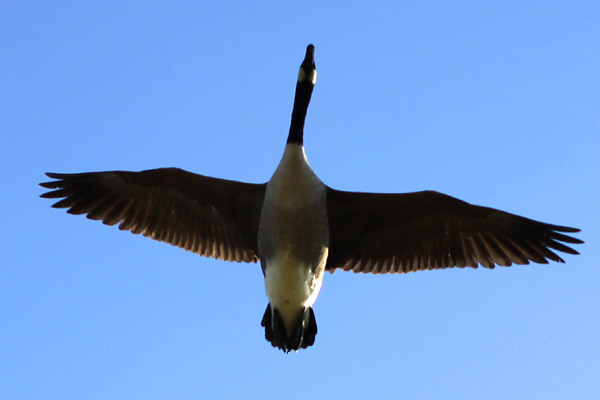 That plan kind of went out the window while we were birding the community garden when we realized that there was quite the morning flight going on. Three of us decided to make for the hawkwatch platform for a better look at the migrants while Seth decided to continue to work the edges while keeping an eye to the sky. Morning flights occur when birds that migrated overnight are looking for decent habitat to put down in when dawn finds them. 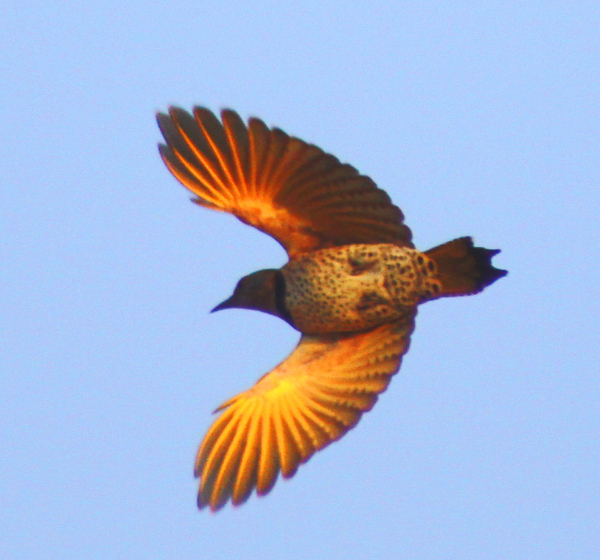 * They tend to be a coastal phenomenon, or at least morning flights are more easily observed along the coast. 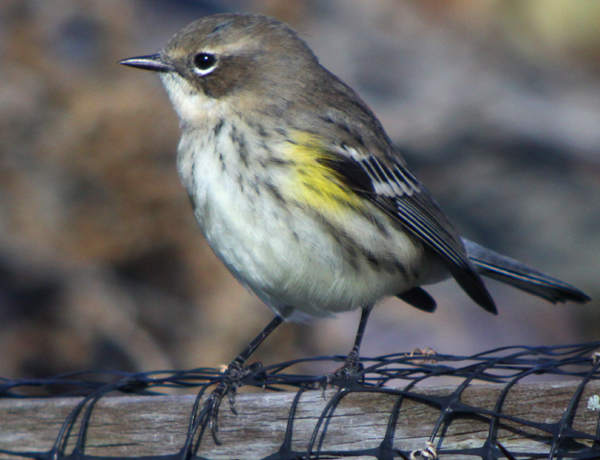 Our morning flight consisted of Purple Finch, Northern Flickers, American Robins, my first-of the-year Pine Siskins, Yellow-rumped Warblers, and a single American Pipit, my first of the year and first ever in Queens. We also spotted a few raptors moving early, including Sharp-shinned Hawks, Cooper’s Hawks, a couple Merlins, Peregrine Falcon, and a Northern Harrier. Better than the hawks were some seabirds that we spotted over the ocean from the hawkwatch platform. Northern Gannets are always cool, and we spotted several, but I was exceptionally pleased by three Royal Terns, my first ever in Queens! Two county birds in one day! 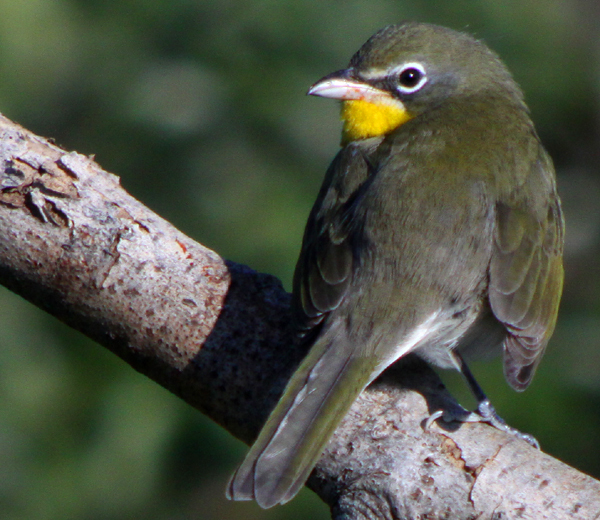 But the birding would continue to get better, and when a Yellow-breasted Chat showed itself to give me my third new Queens bird for the day, well, I was pretty darned happy (keep an eye out for a post devoted just to the chat sighting). After the chat we hit a bit of a lull, and Seth and I took a break to get a drink while checking the community garden again because we had been distracted earlier by the morning flight and not finished searching it. 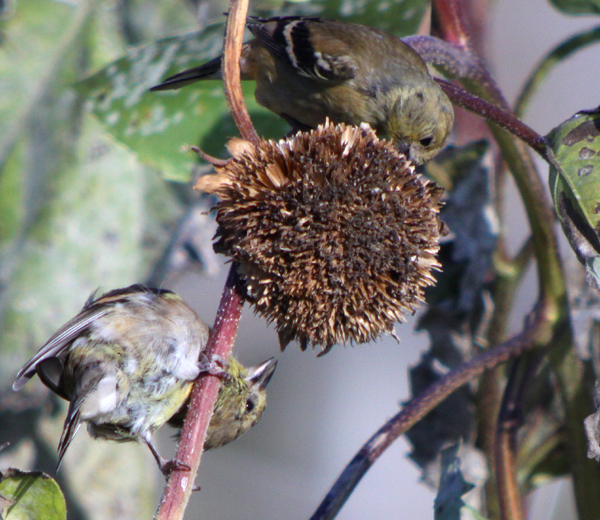 There was still nothing particularly interesting in the garden, but I did enjoy watching American Goldfinches snagging sunflower seeds straight from the source. 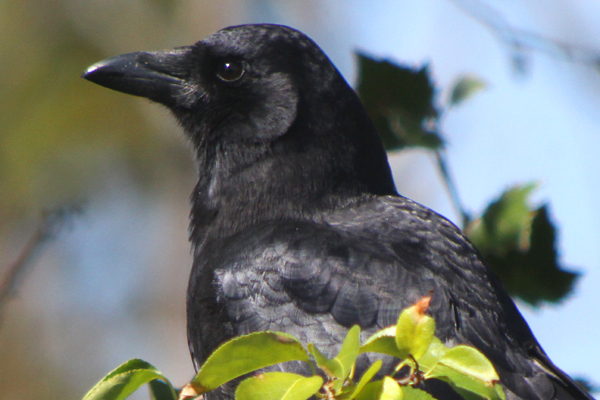 It is amazing how bountiful and bird-friendly New York City’s community gardens are and Fort Tilden’s is neck-and-neck with Floyd Bennett Field’s for producing the best birds of any community garden in the city. After the garden we rejoined Isaac and Tom and continued our birding, not seeing anything spectacular but gradually boosting our day list with common species like Hermit Thrush, Gray Catbird, American Crow, Swamp Sparrow, and Ruby-crowned Kinglet. After a long walk to Jacob Riis State Park and along the brushy scrub that borders the boardwalk there ended up without anything particularly interesting showing up our talk had turned to the day’s scheduled football games and past birding adventures. A chance meeting with another Queens birder (and frequent commenter here), Donna, was nice, but she hadn’t seen anything great either. We made our way back to the cars and decided to do one more sweep of the garden while we were there. 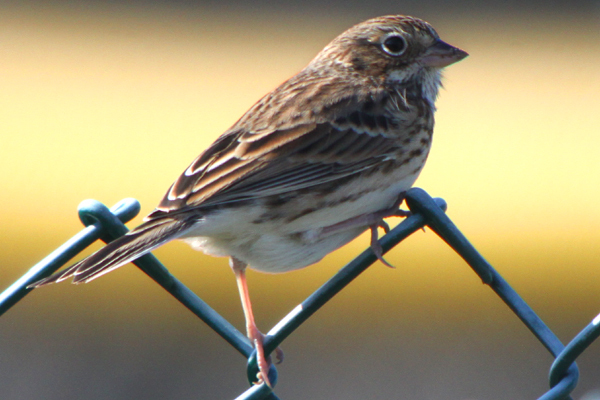 Lo and behold, a Vesper Sparrow popped up and posed nicely on a fence for us. Persistence does indeed pay off! We watched the sparrow for a bit and then I remembered to give Donna a call to let her know about our find. 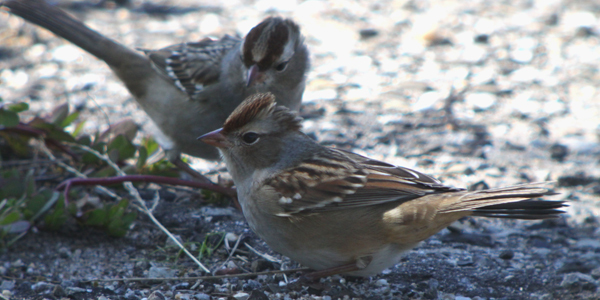 But before I continue I should explain why this one particular brown sparrow with streaks was really noteworthy and the other brown sparrows with streaks that we saw, like Song Sparrows and Savannah Sparrows, were not worth calling in the cavalry. 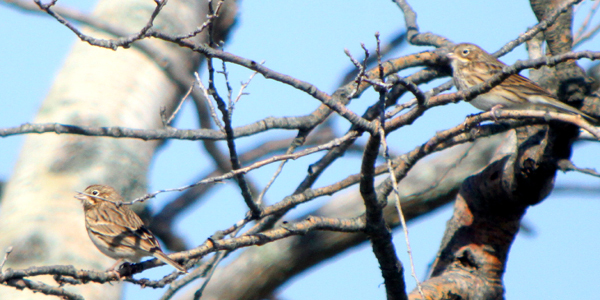 Essentially, what it comes down to is that Vesper Sparrows are declining rapidly, down 49% as breeding birds in New York State between the two breeding bird atlases, and are listed as threatened or endangered in the all of the states surrounding New York. ** Such is the fate of an open-country grassland breeder in the eastern Unites States and this dismal decline in numbers explains why seeing Vesper Sparrows is always exciting. But once Donna showed and we couldn’t find the bird again it was quite the letdown. A flash of white outer tail feathers going up into a tree about fifty yards away caught my eye, however, and, lo and behold, there was not one Vesper Sparrow but two! Scope looks and happy faces all around! Then, just to top off the day, we walked the edges one more time and saw more of the expected sparrows for this time of year, including Field Sparrows, Chipping Sparrows, and several juvenile White-crowned Sparrows, which are in the running for my favorite species of sparrow. It was a heck of a morning’s birding and I am sure glad I got out to see what was out and about. Hope your coming weekend is as good as mine was last weekend bird-wise! *Actually, no one knows for sure why morning flights happen but this explanation sure seems to make sense to me. **Info from The Second Atlas of Breeding Birds in New York State. Nice birding Corey. I enjoy reading about all the good birding places in NY. Yeah, well, looks like you had a decent morning then, ey? Not too boring, I reckon, or was it? No night-herons?